I got my new watch yesterday from Kenneth Cole, and I cannot even truly express how happy I am! Having dreamt of a funny clockwork watch since I was seven, I thought that it was simply impossible to get my hands on one. How wrong I was… As a self-proclaimed eccentric, I could honestly say that I had not seen the skeleton watch anywhere in the last couple of years. Until yesterday, I had not even seen one in the catalogues, let alone in shops here. By the looks of it, Kenneth Cole has branched out in the female watches- he has now created the skeleton watch, the watch with a transparent crystal at the front and the back, as well as a couple of models with a mother-of-pearl face. 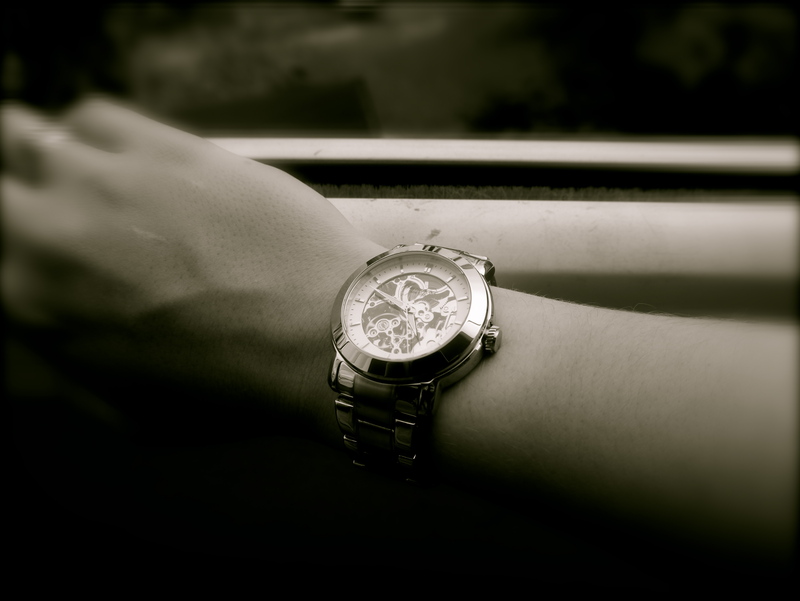 I cannot get enough of mine… Do you think it is ‘in’ to have a skeleton watch? I have not seen many people wearing them. I would love to know what you think! You can also check out my updated pictures on Lookbook and Chictopia. Very good article. I certainly love thiks website. recording to gq, skeleton watches are trend no. 1 when it comes to timepieces. beside that, yours is très cool!